HomeNewsReNew ELP win the FlexPack Recovery Challenge at SPC Impact 2019! The ReNew ELP team were celebrating this week, having won the FlexPack Recovery Challenge at SPC Impact 2019! The Sustainable Packaging Coalition® is a US based group of organisations with a single vision – to make packaging more sustainable. With limited recycling options available to tackle the rising issue of plastic packaging waste, new technologies are needed to tackle this rising issue – which not only has a widespread and detrimental effect on the environment, but also sees valuable resource disposed of. 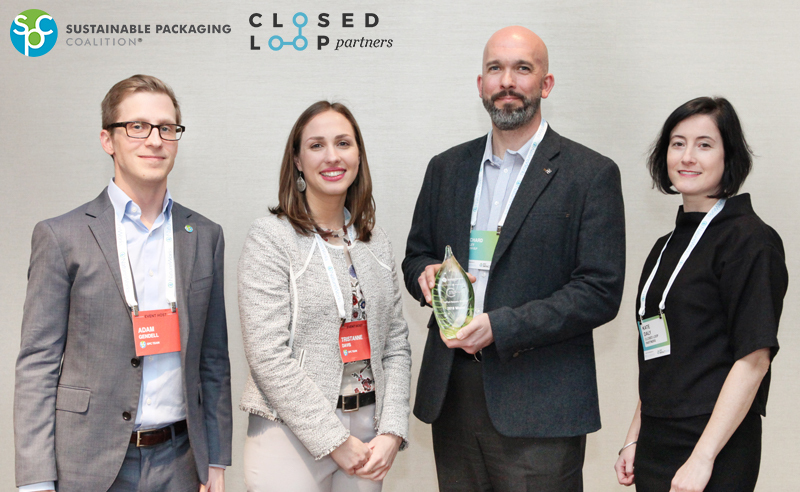 The SPC worked with Closed Loop Partners, an investment firm focused on building the circular economy, to focus the challenge on new ways to allow flexible packaging comprised of several materials to be recovered, re-used and re-processed into new packaging or products, diverting it from the oceans and environment as a whole, and helping to drive a circular economy. ReNew ELP were shortlisted as a challenge finalist, and Managing Director Richard Daley presented at the SPC Impact Conference in Seattle, whose audience included representatives from companies such as Dow, Pepsico, Unilever and Mars; with the aim being to highlight how technology can help with the recovery and recycling of composite plastic packaging waste. In the presentation, we showcased our unique Cat-HTR technology (Catalytic Hydrothermal Reactor). Using supercritical water, ReNew ELP are able to convert end-of-life plastics into a range of high value feedstocks, including oils, chemicals and waxes. These can then be re-used to create virgin plastic material, or as a feedstock for the petrochemical industry, reducing the need for fossil fuel resource and contributing to a circular economy. The environmental benefits from Cat-HTR technology are significant; as well as potentially diverting huge volumes of currently unrecyclable plastic waste material away from incineration, landfills and the oceans, the technology has been assessed by independent experts who calculated a GHG emission saving in excess of 70% when compared to traditional fossil resource. ReNew ELP were thrilled to have won the FlexPack Challenge, and at being given the opportunity to present our technology to some of the biggest multi-national companies and consumers in the packaging industry.